We’re nearing the end of that time of summer when we can enjoy all of the glorious summer fruits that the season has to offer. Peaches are one of my all time favorites. I love basil and peach together. If you use really ripe, fresh, sweet peaches for this frozen yogurt recipe you’ll hardly need any added sweetener at all. I used raw wild flower honey in this, but you could use sugar or agave nectar if you wish. 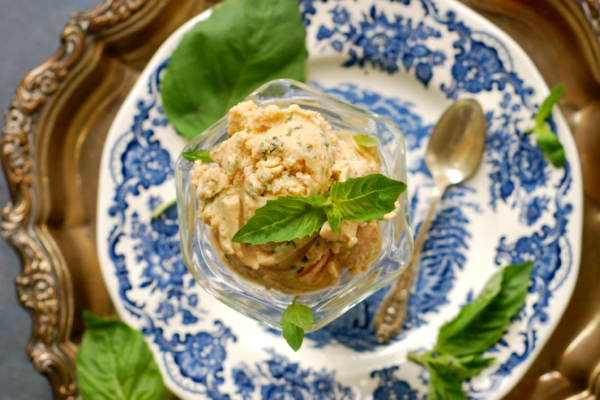 Place chopped peaches, basil and honey in the bowl of a food processor and puree until smooth. Place peach puree in a mixing bowl along with the yogurt and lemon juice. Mix well and freeze in an ice cream maker according to manufacturer’s directions (15 to 20 minutes.) Transfer frozen yogurt to a freezer safe bowl with a tight fitting lid. Freeze for 2 hours before scooping and serving. This is wonderful with homemade shortbread!